Tweet CMON - the Cluster Monitor has recently been released and here is a little how to about how to install from binary and source (at the end), deployment etc. The picture at the end of this post shows how you can deploy CMON. Yes, I have two slots - if I run cmon from host 10.0.1.5, then it is fine (id=10), but in this case, I can connect cmon from any host (id=9). Point is that you must have a slot free with "any host" or from an explicit host. You must also have MemReportFrequency=30 (or some other value, in seconds) in order to get the memory usage events sent from MySQL Cluster. Otherwize, CMON will not be able to present memory utilization information! CMON and the  RRD scripts needs a mysql connection to speak mysql server holding the cmon database. ## servers in my cluster. YOU MUST SPECIFY THIS! Copying files to /var/www/html ..
## from the web client, but there is no other functional impact! The rrdtool stores data files in a data directory. Specify the full path to the data directory (about 20MB free space will be neeeded). Configuration now complete - you can edit the /usr/local/cmon/bin/../etc/cmon.conf manually if you wish. 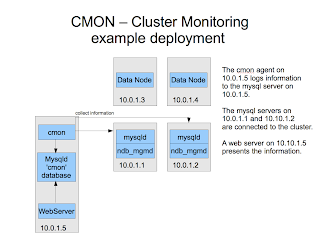 Please wait while cmon is starting up..
## COMMENT: connect a mysql client to the mysql server holding the cmon database. Requires that you have a webserver with php-mysql installed. As MySQL Cluster is not able to distinguish between an API or a MySQL Server, we need to tell CMON where our mysql servers are! And so on, you need to add every mysql server you want to monitor. All information is stored in SQL tables so it is easy to write scripts around it. Here you can find some example scripts. Recommendation: If you have the 'mysqld' on 10.10.1.5, connect it also to Cluster and you can use it for administration! ## then you must make sure it is! ## COMMENT: end the prefix with 'cmon' and life will be easier. Proceed at section 2 above. Also, if you have suggestions for improvements, let me know! [root@s214 bin]# Sep 28 16:02:55 s214 cmon: Could not connect to management server(s). - make sure you have an API slot free in config.ini (http:// www.severalnines.com/cmon/doc/apislot.html ). cmon will continue to work but the aggregation of ndb statistics such as diskdata info will not work. I am on Debian Lenny and i could not compile cmon. There is a much newer version there, and with updated instructions how to build.